Everyone knew the WMD claims were fake. 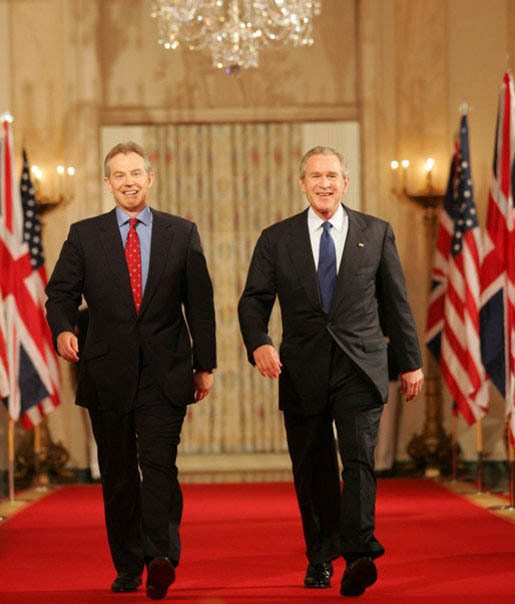 For example, Tony Blair – the British Prime Minister – knew that Saddam possessed no WMDs. If America’s closest ally Britain knew, then the White House knew as well. And the number 2 Democrat in the Senate -who was on the Senate intelligence committee – admitted that the Senate intelligence committee knew before the war started that Bush’s public statements about Iraqi WMDs were false. If the committee knew, then the White House knew as well. But we don’t even have to use logic to be able to conclude that the White House knew. Specifically, the former highest-ranking CIA officer in Europe says that Bush, Cheney and Rice were personally informed that Iraq had no WMDs in Fall 2002 (and see this). In the 23 months I was there, I never saw anything that I would characterize as evidence of weapons of mass destruction. The CIA warned the White House that claims about Iraq’s nuclear ambitions (using forged documents) were false, and yet the White House made those claims anyway. The Washington Post reports that a secret, fact-finding team of scientists and engineers sponsored by the Pentagon determined in May 2003 that two small trailers captured by U.S. and Kurdish troops were not evidence of an Iraqi biological weapons program. The nine-member team “transmitted their unanimous findings to Washington in a field report on May 27, 2003.” Despite having authoritative evidence that the biological laboratories claim was false, the administration continued to repeat the myth over the next four months. A British official said that “the intelligence and facts were being fixed around the policy”. In January 2004, The Carnegie Endowment for International Peace report on WMDS in Iraq concluded that the evidence prior to the war indicated that Iraq’s nuclear program had been dismantled and its chemical weapons had lost most of their lethality. In addition, the report concluded that the administration “systematically misrepresented the threat from Iraq’s WMD and ballistic missile programs”. In addition, it is a well-understood principle that if someone has been caught in a lie, we are less likely to believe him. For example, a witness who is caught in a lie during trial is unlikely to be believed by the jury when he makes another statement. Well, Cheney and other high-level White House officials repeatedly implied that Saddam and Iraq had ties to Al Qaeda and 9/11, when they knew that wasn’t true. Indeed, Pulitzer prize-winning journalist Ron Suskind reports that the White House ordered the CIA to forge and backdate a document falsely linking Iraq with Muslim terrorists and 9/11 … and that the CIA complied with those instructions and in fact created the forgery, which was then used to justify war against Iraq. And see this. The government also spied on American citizens (even before 9/11 … confirmed here and here), while saying “we don’t spy”. And the government tortured prisoners in Iraq, but said “we don’t torture”. In other words, high-level officials in the administration were caught in repeated untruths, and so their statements about believing good faith that Iraq had WMDs is less believable. But if the White House knew that Iraq didn’t have any WMDs, why did we go to war in Iraq? Well, several very high-profile figures have said it was for the oil. See this, this and this. All wars on based on propaganda. If you still believe that the government invaded Iraq due to WMDs or links to terrorists, this is why.